Explanation: This mosaic of x-ray images cuts a swath across the photogenic Rosette Nebula, a stellar nursery 5,000 light-years from Earth in the constellation Monoceros, the Unicorn. Constructed from data recorded by the orbiting Chandra X-ray Observatory, the mosaic spans less than 100 light-years and is color coded to show low energies in red and high energy x-rays in blue. At the upper right is the young star cluster NGC 2244, central to the Rosette Nebula itself. 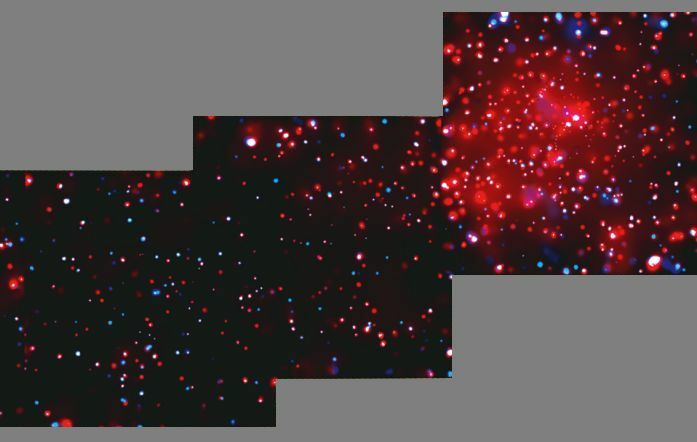 The hot outer layers of the massive stars are seen to be copious sources of x-rays, but a diffuse x-ray glow also pervades this cluster of newborn stars. Since these stars are so young (less than few million years old!) the diffuse x-ray emission is thought to be powered by energetic, colliding stellar winds rather than remnants of supernovae explosions, a final act in the life cycle of a massive star. Moving away from the center, south and east across the nebula (upper right to lower left), the hot, blustery environment gives way to dense molecular gas, absorbing low energy x-rays while revealing the penetrating high energy x-rays from embedded stars.